This sturdy box contains the entire collection of cards from the original Apple to Apples Core Game, plus expansions 1 & 2 from the original Apples to Apples Core Game Set. Apples to Apples-Party Box is a great party game. Each person gets a turn reading a green card that states a person,place thing,event etc. Everyone else has to place a card down(as quickly as possible as not to be the last one) that they think would be the best possible conclusion(to the green card). But, you may think you have the best answer, but, it is up to the person who has the green card. This is a good game to play with either your family or friends when no one can sit down and play a serious game. Great party game! Able to play with many people, and easy to explain/play. Great conversation starter, and sure to make everyone laugh! Our favorite party game! Accommodates up to 10 people and is always fun. The game has hundreds of cards so no two games are similar (the game never gets stale). Blank cards are provided so you can come up with your own funny ideas. Enjoy! Not my favorite at all, but I'll play when everyone else requests it. Now, I actually try to put down cards that no one will pick.... I still win about half the time. Still, since its a good game to get people involved and is a good way to start off an evening, I think its an important part of a well-rounded game collection. If you're going to get Apples to Apples, this is the version to get. 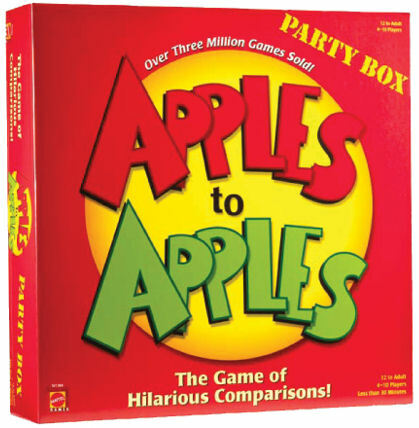 I was introduced to Apples to Apples in college and met many new people and had many great nights of laughs thanks to this game. Apples to Apples is a fun party game, best with five or more players, that's more about knowing your opponents than appropriate matching. For that reason, however, this game doesn't really work with newly introduced people - so don't use it as an ice breaker! If you're looking for a game that will get your family into playing boardgames with you, look no further. Apples to Apples is great party-game fun for kids and adults alike. An all around fun party game, can really bring life to the party.